Virginia Woolf, Abbeys and Cathedrals. 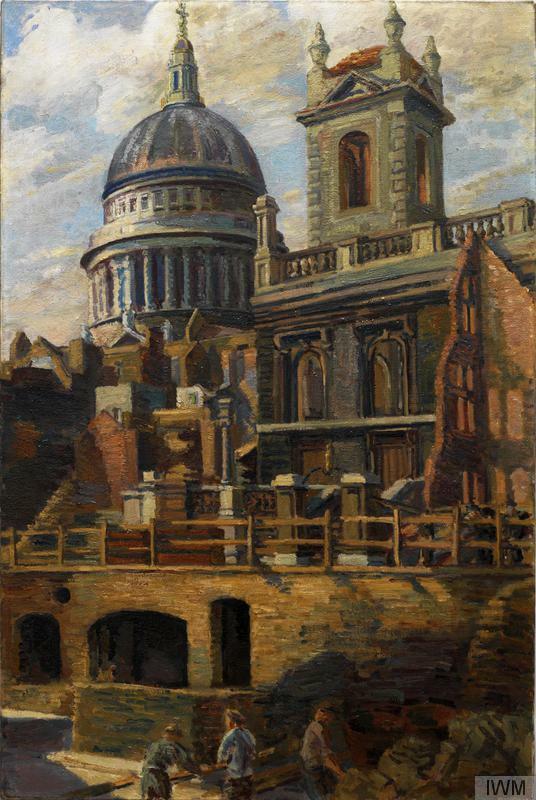 Virginia Woolf’s interest in St. Paul’s Cathedral was shared by Duncan Grant who made numerous studies of the monument throughout his life. Appearing as early as 1893 in a colourful study made when the artist was only eight years old, the building continued to feature in Grant’s oeuvre both as the visual focus for a composition, such as in his painting St Paul’s, 1934, and as a distant – yet no less potent – element in works such as St Paul’s, c. 1933-4. In the drawing above, from a sketchbook in the Angelica Garnett Gift created around 1936, Wren’s iconic dome takes centre stage, the attention given to detailing the building over its surroundings demonstrative of Grant’s particular fascination with the subject. 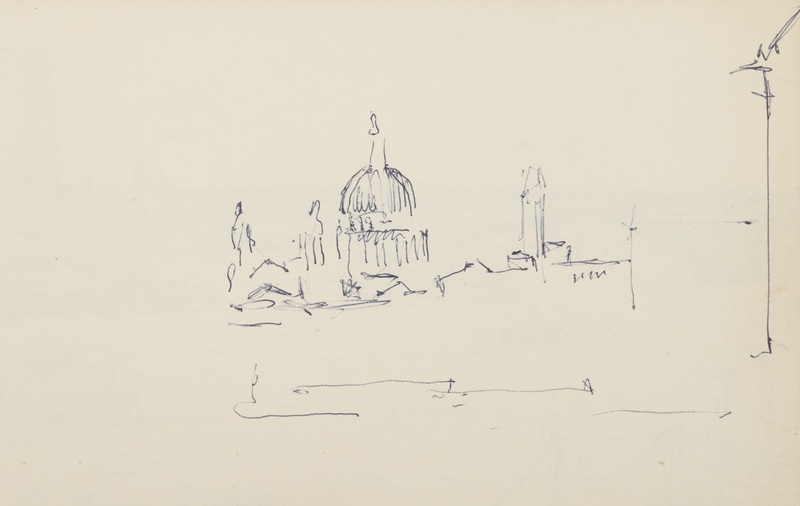 In another sketchbook, a ‘to-do’ list has been hastily scribbled by the artist, the first item being ‘Finish St. Paul’s’. As the date of this sketchbook is unknown, the note could refer to any one of his works on the subject. As it was not spiritual sentiment which drew Grant to St. Paul’s as a subject – he and other members of the Bloomsbury group were not religiously inclined – it was the building’s impressive design and dominant position in London’s skyline which instead impressed him. Bloomsbury scholar Richard Shone has noted how Grant was a great admirer of Christopher Wren’s architecture and in particular that of St. Paul’s, thereby explaining why it so regularly appeared in his paintings of the city, either as focus for the work or as a prominent background feature. The building’s solidity and permanence was particularly celebrated following the Second World War when photographs of its dome puncturing the smoke filled sky became iconic symbols of the country’s resilience and determination in the face of conflict. 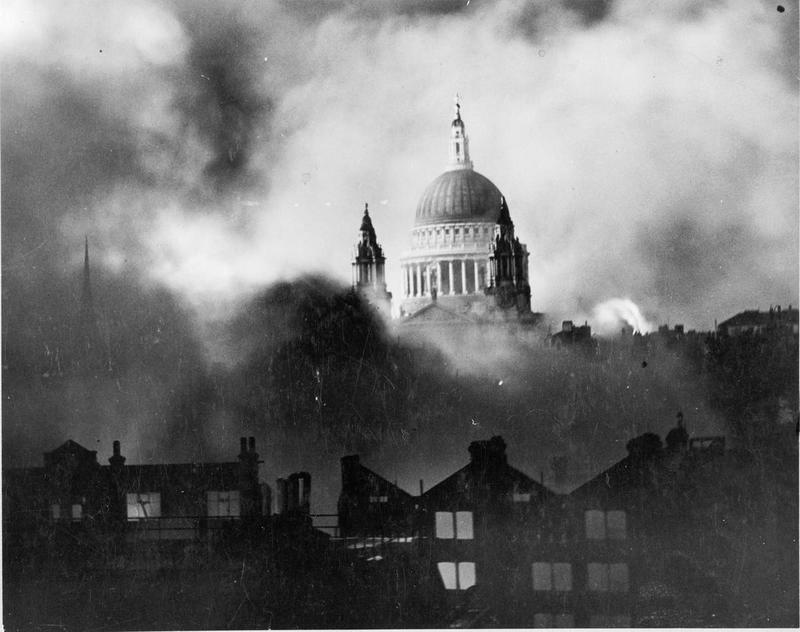 During the Blitz, the City of London was targeted by German bombers who caused such widespread destruction that one contemporary reporter dubbed it, ‘the second Great Fire of London’. While the cathedral itself was hit by 28 bombs, it miraculously survived, and as a result, dramatic views of the building were opened up from amongst its decimated surroundings. Having been a significant subject in the artist’s works, it was fitting that following his death in May 1978, a memorial service for Duncan Grant was held at St. Paul’s; a place that had inspired him throughout his life.